Handle, lift, & rotate pallets more effectively and ergonomically. Positioners allow pallet height and rotation to be controlled in a loading or unloading application. Reduce injuries, increase productivity, and increase work speed with a pallet rotating positioner. Transport pallet loads to their desired location and raise them to an ergonomic work height either manually or with an electric lift to reduce the risk of injury from workers straining to pick products up off of the floor. 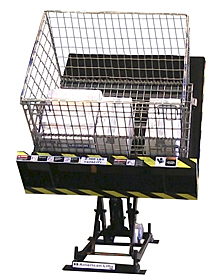 Designed to be used in the strictest of hygiene applications to transport pallet loads to their desired location and raise them to an ergonomic work height, to reduce the risk of injury from workers straining to pick products up off of the floor. Add turntables to your existing scissor lifts for more versatility in using your scissor lifts. 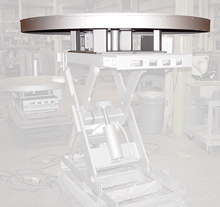 Manually manipulated turntables help prevent injury from over-reaching, bending and twisting by rotating the load to a more convenient position for the worker. Powered turntables make the work of pallet loading and unloading much easier by rotating the load to the worker's position. Makes ergonomics much improved, reducing injuries from bending, twisting and reaching. Add to existing scissor lifts or floor mount. A pallet turntable gives you clearance all the way around the pallet for stretchwrapping in place then loading onto a pallet jack for removal to staging area. Rotate the turntable while adding wrapping, then turn until pallet jack forks are able to access slots on pallet. 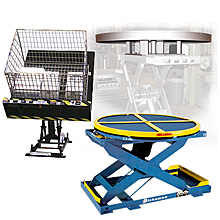 The most stable and dependable method of positioning or re-orienting loads, these tilt tables are low maintenance and long lived. Use for container loading/unloading, parts assembly/dis-assembly, palletizing/de-palletizing, work positioning, and load upending. Pallet lifters cut out the need for a forklift by lifting pallets straight from the floor. Forks extend from inside the unit once the pallet has been positioned using a pallet truck and lifts the pallet to an ergonomic work height for easy loading and unloading of the pallet load. Pallet Positioners help you build or break down pallet loads with a minimum of bending, reaching, stretching or walking around. They make loading/unloading pallets at conveyors, packaging stations, workbenches, loading docks, etc. much easier and more ergonomic. The units automatically adjust the height of pallets as boxes are added or removed. They position the lift for the operator to either load or unload it at the ideal ergonomic work height. The rotating platform on the pallet positioner puts the load right where you need it. It rotates easily, with a minimum of force. Just push it and it moves. Tilters are true ergonomic tools. They are designed to angle the work to a more advantageous position during the loading or unloading process. By maintaining the load at a comfortable and consistent working position the worker does not have to strain to reach container contents. With tilt angles from 30 to 45 degrees, workers can put the load where they need it in order to better pull or place product.